Chamaedorea have been used as indoor plants for many years with Chamaedorea elegans or ‘Parlor Palm’ growing to 2m being one of the most popular. Chamaedorea are a thin stemmed palm that will cope with most indoor conditions. C. elegans has been grown as an indoor plant for 100s of years, however wholesale growers do offer a range of species worth considering for their own qualities. Grown mainly as potted specimens, these attractive decorative plants grow well to temperatures as low as 12°C and require little care. Very popular in commercial settings such as office areas and shopping centres where the foliage is attractive year round and plants require very little maintenance. A number of other species are also grown, all with different foliage and growth habits. C. radicalis is slow growing and cold tolerant, worth consideration for outdoors in cooler climates. 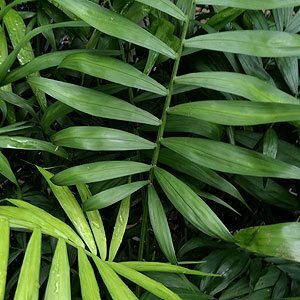 C. seifrizii (syn Chamaedorea erumpens ) is known as the Reed Palm and Bamboo Palm, is a taller, but slow growing variety also suitable for outdoors, excellent for patios and balconies. C. microspadix is a clump forming species from Mexico, thin bamboo like stems, similar to C. seifrizii.